INDIANAPOLIS — The scene on the Indiana Senate floor Thursday looked less like an official lawmaker discussion, and at times more like a game show. Lawmakers discussed SB 132 Thursday morning, which would require high school students to pass a civics test before they graduate. Students would have to get a score higher than 60 percent to complete the requirement and could take it as many times as they need. The bill was proposed by Sen. Dennis Kruze, R-Auburn. Before a floor vote in the Senate, lawmakers discussed the merits and problems with the bill. 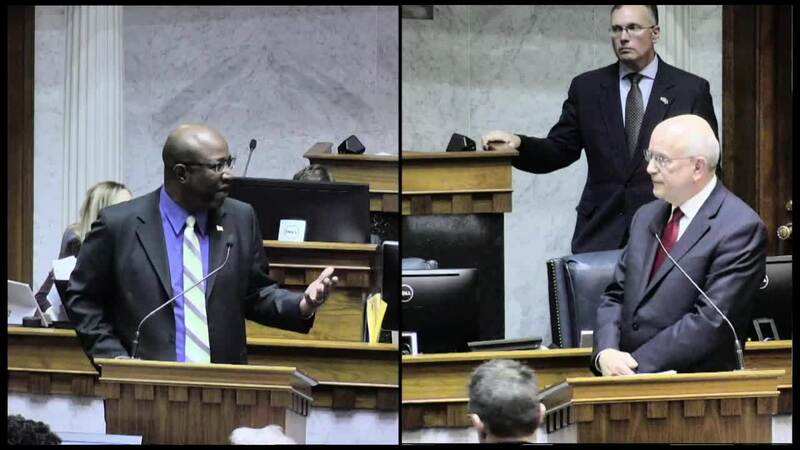 This led to a discussion between Sen. Greg Taylor, D-Indianapolis, and Kruze. Taylor challenged Kruze on the bill, and on whether he knows the answers to some simple civics questions. Kruze: “Democrats control the House of Representatives. [Republicans] control the U.S.
Before the vote, Taylor called it “ridiculous” and said he was offended by the test by the lack of black history. Sen. Victoria Spartz, R-Noblesville, who emigrated from Ukraine in 2000 and became a citizen in 2006, spoke in support of the bill. Spartz started getting emotional during her testimony of the bill. Kruze said he believes anybody who grew up in the United States should be able to answer the same questions that somebody applying for citizenship must answer. The Senate passed the bill, 31-17. It will move to the Indiana House of Representatives. If the proposal becomes law, the new requirement would begin with the 2020-2021 school year.